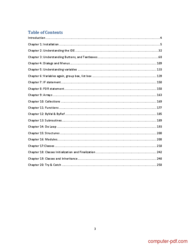 This ebook is the result of combining a number of tutorials available on the site. It gives basic information about using the language, however it does not cover every aspect of the language. There are lots to learn. I tried to put screen shots in most of the tutorials along with the source files embedded in the PDF file itself. If you still need to see how to do some stuff, check the website, there you can watch video tutorials which cover the same exact topics in this book. It is never too late to start learning and it would be a shame to miss an opportunity to learn a tutorial or course that can be so useful as VB.NET Programming especially when it is free! You do not have to register for expensive classes and travel from one part of town to another to take classes. All you need to do is download the course and open the PDF file. This specific program is classified in the Visual Basic language (VB) category where you can find some other similar courses. Thanks to people (like you?) Who share their knowledge, you can discover the extent of our being selected to easily learn without spending a fortune! VB.NET Programming. is available for free by its author. But also many other tutorials are accessible just as easily! Computer PDF is also courses for training in Visual Basic (vb) computer programming language and many others IT. You should come see our Visual Basic language (VB) documents. You will find your happiness without trouble ! The latest news and especially the best tutorials on your favorite topics, that is why Computer PDF is number 1 for courses and tutorials for download in pdf files - VB.NET Programming. and Visual Basic language (VB)! 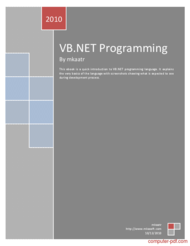 Download other tutorials for advice on VB.NET Programming. you will see! We will do everything to help you! And you dear surfers what you need? The best course and tutorial, and how to learn and use VB.NET Programming. of course! it is well explained and understanding, kudose to the author and website owner.